When it comes to food, Greeks have it all. Our variety of oregano has earned the name Kaliteri (meaning: the best). Our thyme honey wins international awards (and so we put it in every dessert). Our olive oil’s robust flavor has even driven people to steal it at gunpoint. Really though. Greek meals are made with the best ingredients available, yet we’ve missed the boat on one: The Avocado. For some reason, this creamy green vegetable fruit has been lost in Greek cuisine until now. With avocados being in season and all over the place, I decided it would be a good time to change that. A couple of these steak gyros later and I’m in a food coma sold. Avocado Tzatziki, welcome to Greek cuisine. Shred cucumber into a bowl (I used the largest side of a box grater). Squeeze and drain cucumber in small handfuls to remove excess water. Add mashed avocado, yogurt, fresh dill, lemon juice and minced garlic. Add salt to taste and refrigerate until ready to use. For the marinade, whisk olive oil, garlic, oregano, salt and pepper together. Place skirt steak in a large dish and coat with marinade. Heat a cast iron skillet over medium-high heat. Place steak in hot skillet and cook for 5-8 minutes on either side or until cooked to your liking. If you’re not sure how to know when it’s done, give it the finger (test). I Remove steak from skillet and allow to rest. 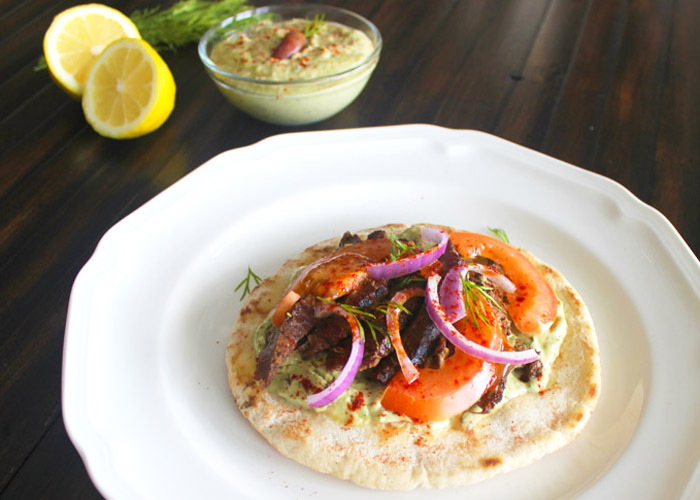 While steak is resting, use the same skillet to grill each pita for approximately 1 minute on each side. After steak has rested for 5 minutes, thinly slice it against the grain. 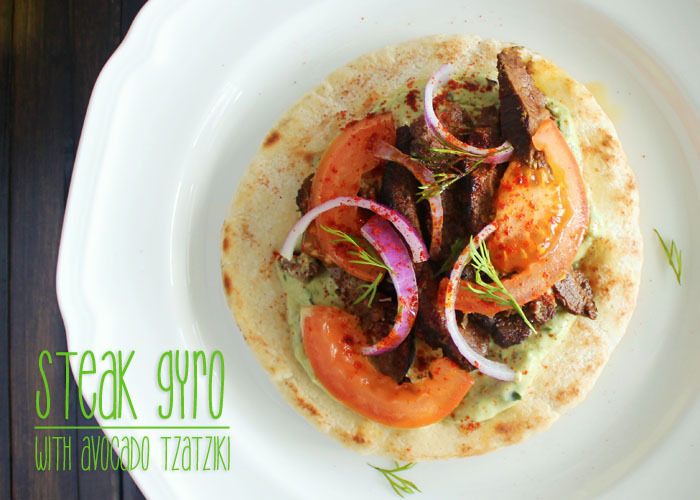 Take one grilled pita and spread Avocado Tzatziki on it. Top with steak, sliced tomato and sliced onion. Garnish with paprika and any leftover sprigs of dill from your Avocado Tzatziki.